Do you eat a single serving size of these snacks? Let’s start with chips. 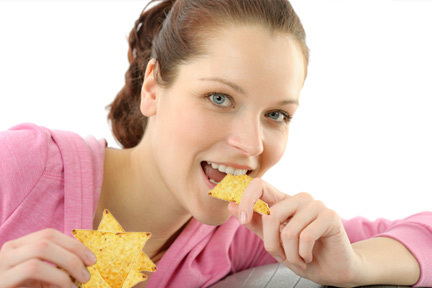 A standard serving is 12 regular-size tortilla chips. For crackers – a serving is about 14 regular-size crackers. Finally: For popcorn – one serving, without butter, is a generous 3-and-a-half cups. Why do we eat so much when we’re stressed? Because we can’t taste things as well! Now, 90% of us admit to stress eating – but stress suppresses our ability to taste. So we eat more – trying to taste our food! So when you’re stressed, reach for something spicy or strong tasting, like a pickle. Or, relax first without food. Take a walk, calm down, and when you eat, your taste buds will be functioning more normally and you’ll eat less. Swap your whole-grain tortilla chips for popcorn. Popcorn contains 15 times more disease-fighting antioxidants. Why? Because unlike corn tortilla chips, popcorn includes the nutrient-packed hull of the corn kernel. Plus, your kids can use it to make a fun garland to hang on your Christmas tree. Are you going to a party this weekend? 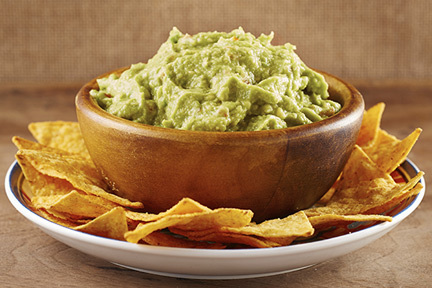 Dip your chip in the guacamole! According to Clemson University researchers, you’re more likely to be sickened by salsa than by other dips! When they tested different types of dips that had been contaminated by double-dippers, they found that the salsa had 7 times more microbes than the others. Why? According to the study, the runny consistency of the salsa makes it easier for germs to migrate from the half-eaten chip into the bowl of salsa.